X-Small - $25.99 Small - $32.99 Medium - $48.99 Only 4 left! It took a lot of effort to get your child that Hatchimal. Maybe you lined up at the mall to score this hot toy, maybe you traded an arm and a leg for it or maybe you waited until the wave of public interest was over to get the little hatchling, either way we can all agree that it's crazy what we'll do to get our kid what they want. Anyway, it was great watching your little one trying to coax the little chick out of its egg. Turn out, there's a reason this unique toy was so popular! There's something in a lot of children that makes them want to hatch something out of an egg, watch something hidden and dormant come to life right before their eyes. We get the appeal but the problem is, what do you do with that chick once it hatches? Does your kid bring it to school? Do you bring it to work? Nope, if you're honest, neither of you has the time to raise a new born chicken. So, when the little Penguala hatched you were happy that there wouldn't be any required hand feeding, no checking on the little guy in the night, and no smelly white droppings around the house. Instead, once out of the egg, this little animal sang, danced, and peeped it's way to full blown childhood. Your kiddo has talked and coaxed their Hatchimal into the mature toy it is today, now it's their turn to take on the role. They'll have plenty of fun wearing this costume, after watching their toy we bet they do a great impression of the peeping and songs the little bird makes. Your kiddo will love this costume with the polka dotted shell and brightly colored wings. 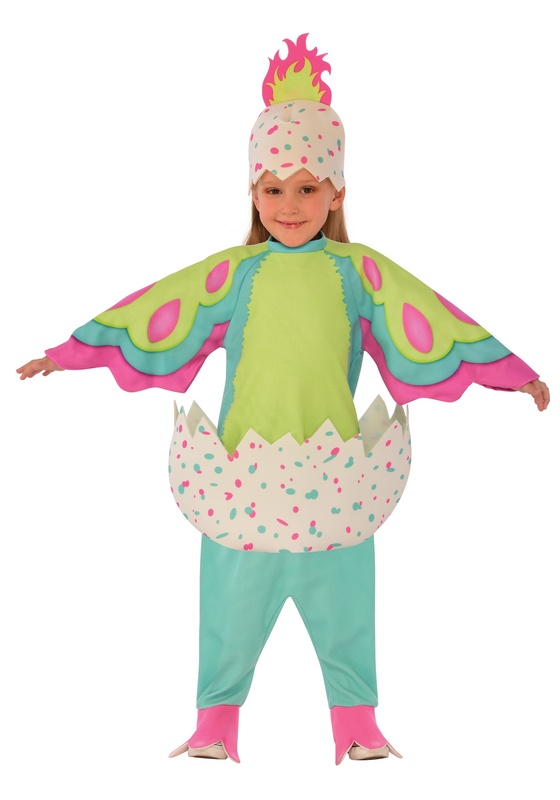 It won't take much poking and prodding to coax this little Hatchimal into the Halloween night!